Lexus enters the lucrative and crowded baby SUV market with its new luxurious, compact crossover, the UX. Priced from $44,450, its main rivals are the BMW X2, Volvo XC40 and Audi Q3. As Lexus’ most affordable SUV, and beaten in price only by the ageing CT200 hatchback, the Japanese brand hopes to attract a new customer; one with a discerning eye for design, comfort and tech. In this case, we’re looking at the hybrid 250h variant – a particularly interesting drop, considering the UX’s main competition, the BMW X2 and Volvo XC40 are yet to arrive powered by a PHEV or BHEV (though Volvo has revealed a PHEV XC40 and BMW has teased an X2 hybrid) and Audi is yet to introduce an E-Tron compact SUV. In Australia, the 250h is the only UX hybrid variant available and it is available as an AWD and FWD. The UX is the first Lexus to be underpinned by Toyota’s Global Architecture-Compact platform (which also underpins the Toyota Corolla and Toyota C-HR) and uses Lexus’ fourth generation hybrid powertrain with a 2.0L, four-pot petrol engine. How much is the Lexus UX 250h? 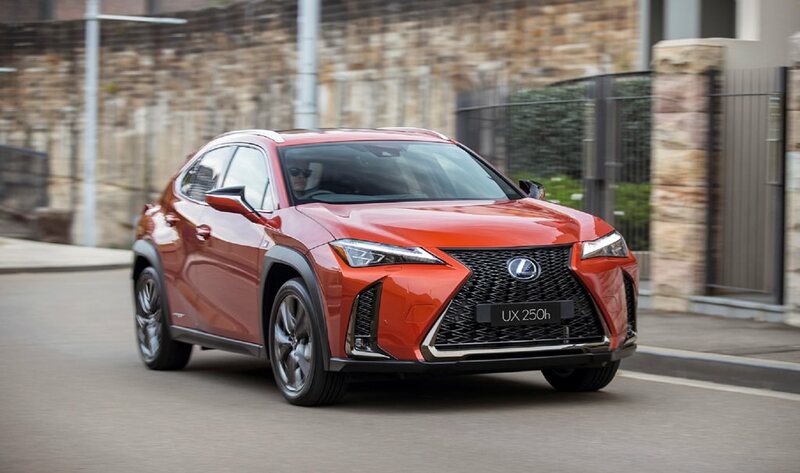 The Lexus UX starts at $44,450 for the petrol engine version, and the 250h starts from $47,950. Our car isthe FWD F Sport grade with a base price of $56,950 and includes sports-tuned adaptive variable suspension with stabiliser bars and rear performance damper, for a more polished ride around town. F Sport design features include a unique grille, 18-inch alloy wheels front bumper fog lamp bezels; as well as interior garnishes like adjustable sport seats, a leather steering wheel and a leather-trimmed gear knob. Our car was also optioned with the F Sport enhancement pack 1, which introduces a moon roof for $2,500. If you want that AND the banging Mark Levinson 13-speaker sound system, a head-up display, panoramic view mirror and Lexus’ smart key card, you’ll be looking at an extra $5,600 on top of the base price for Enhancement Pack 2. Packed with safety, comfort and surprising details for those who seek them out, particularly when it comes to the UX’s driver-centric infotainment system, Lexus has put a huge focus on design here. The sporty-luxe aesthetic of the NX SUV’s baby sibling is part of Lexus’ recent rebrand that sees it look to a more architecturally-inspired and more design-conscious model. With this, it hopes to win the hearts of those who are entering the luxury space for the first time and a customer who might have avoided the Japanese brand during its snoozy years; while also tapping into the increasing desire for a city car that does it all (or at least appears to), feels luxurious and sporty, is safe and has plenty of vision. In short: child-free young couples and empty nesters. Is the Lexus UX 250h easy to live with? Slung nice and low, both in roofline and in centre of gravity, the UX compact crossover is certainly more hatch than SUV. That said it still manages to feel spacious, light and bright and highly liveable; in the city and out. It has reasonable room in the back for two adults (though it can seat three), unlike the main complaint many have had with its platform-shared cousin, the Toyota C-HR. The backseat has plenty of vision and surprisingly well-bolstered seats that are adorned with beautiful stitching, drawing from the Japanese art of Sashiko. The UX has Lexus’s Safety Sense+ as standard, which includes a pre-collision system with pedestrian detection, active cruise control, lane departure assist, traffic sign recognition (that works... well, most of the time), auto high beam, blind-spot monitor and rear cross-traffic alert. On top of that it also has eight airbags, reversing camera, parking sensors and vehicle speed-limit warning, earning it a top ANCAP score of five stars. When it comes to infotainment, the 250h F Sport is stacked. The 10.3-inch display and system is easy to operate via a touch pad, once you get the hang of it. No AppleCarplay or Android Auto (yet) but the system uses a very cool haptic touch tech (when the sense of touch is recreated on a touch screen when you press it). In addition, our higher grade UX had electronically adjusted seats, both which were air-cooled and heated, an illuminated cabin upon entry and an electronically adjusted steering column – small luxuries that are not so common in this segment and if you’d have bought this as your first luxury car, you’d happily get used to very quickly. In terms of other liveabilities, it’s cheap to run, clocking in a claimed (4.5L/100km (combined, FWD) and 4.7L/100km (combined, AWD) for fuel economy, easy to park, has ample boot space for two people wanting to get away, and brags some seriously impressive quality of fabrics inside. The UX is not the best choice for families, it lets its bigger brother, the NX take that role, but it is more spacious than expected. How well does the Lexus UX 250h drive? From the driver’s seat, the UX gets a gold star for vision: something Lexus designers really wanted to express with the UX's design, and they’ve nailed it. Drawing from the Japanese architectural art of bringing the outdoors in, or simply, making small spaces look larger, the UX encompasses that ample, above the traffic vision many people love in an SUV. And yet, it has the planted, featherlight feel of a hatch – of course, this is a personality trait of good crossovers in general, but Lexus has found the sweet spot with the UX and nailed the visibility. Handling is supple and the steering is sharp, weighty and full of feel. Thanks to the Sports + drive modes (one of five drive modes on this variant), the UX will flex its muscles into something a lot tighter, dynamic and performance-y, when called upon. In the more comfortable modes, the steering is just as direct and ride is softer and quieter, without losing its sporty edge. Ride quality is great, with very minimal road noise to note, and it sails comfortably over uneven roads just fine. With 131kW of power from the combined system, the hybrid performs and accelerates well. However, when pushed, the petrol engine can at times feel unrefined – but it wouldn’t be something many would notice and it's the smallest of complaints on a large list of pluses. Lexus really knows its customer here – the UX 250h is sporty, youthful and luxurious. It ticks a lot of boxes when it comes to safety and comfort, but isn’t trying to be everything to everyone – and that has to be applauded. If anything, this hybrid crossover by Lexus is a seriously compelling frontrunner in a segment that is highly competitive and increasingly saturated.